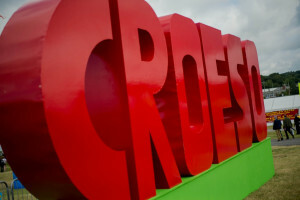 I wondered, while listening to Rhodri Talfan Davies speak this week on two occasions at the National Eisteddfod, if some version of that sentiment ever entered his mind. It certainly entered mine. It’s a striking phrase coined by George Eliot to express her frustration at her contemporaries’ failure to grasp the spirit of the times. How slow we are – those of us not touched by genius such as hers ̶ to see the writing on the cultural wall in front of us. A new dispensation is coming and we need the ideas to meet it. What we’re really seeing are powerful commercial interests that want to chip away at the notion of a publicly-­owned broadcaster. A publicly-­owned broadcaster committed to serving everybody irrespective of background. Why? Well, because it doesn’t fit with an ideological view of the world where consumerism must trump citizenship every time. For them, public service broadcasting is a rather unpleasant system that doesn’t trust the public to make free choices as consumers. But just because the terms of the current debate can feel deeply frustrating doesn’t mean we can afford to ignore it. There is simply too much at stake in this Charter Review. Get it wrong, and we could see public funding being reserved for a narrower range of rather niche programmes that commercial companies wouldn’t be interested in making. The BBC would become a sort of creative ‘polyfilla’ – there to fill the gaps left by the market. And the licence fee could be wound down over time…. The result… would be to dismantle the BBC and with it the broadcasting system not just in the UK, but here in Wales too. Because I’m an optimist, perhaps my biggest hope is that the Charter Review period provokes that real and far-­reaching debate about the future of broadcasting in Wales. It is an opportunity not just to ask what sort of broadcasting we want, but also what sort of Wales we want. We should be prepared for a passionate and often heated debate. In fact, we should demand one. And we should demand it on the right terms. There must be an end to campaigns which focus solely on Welsh-language media. The two main languages of Wales are in this together or their broadcasting futures decline together. Being at an eisteddfod it is easy to see why the culture of Wales matters but this is not so clearly perceived outside Wales. Demanding something is easy but cuts little ice with those preoccupied with concerns closer to their own homes. A case has to be made, with confidence and with proof that the desired outcomes are feasible. We should not be afraid to think creatively about new ways of ‘doing media’. As well as a debate we need concrete suggestions. The Institute of Welsh Affairs, through its Wales Media Policy Group, is working towards those by updating the Media Audit it produced in 2008. With a basis of facts rather than rhetoric we have an opportunity to demand a great deal more than a debate. Since our successful first Cardiff Media Summit last November we have held regular meetings of a forum nature at which a range of media interests is represented. Our Audit will cover provision in broadcasting, the press and online material in Wales, along with a review of major statements and documents about the media in Wales. On the basis of these facts and the themes which emerge from them a working party is developing policy proposals. These will be broad in scope and include issues of governance and also diversity, training and employment matters. We will publish the Audit and Proposals on 12th October. We have invited a number of media academics to respond promptly via the IWA clickonwales site. In order to further policy development we are organising the second Cardiff Media Summit on the 11th November at the Wales Millennium Centre. We have invited media researchers from all Welsh universities to link to the summit. Academic scrutiny of Welsh media is an essential part of a healthy media landscape. Rhodri Talfan Davies ended his eisteddfod speech with a phrase that could hardly have been more to the point. You pay for us, so it is your voice that will matter most in this debate. Just make it count. But he didn’t tell us, individual viewers and listeners, how to do that. It’s important to get one’s voice on the record, otherwise it can’t be counted. One way to do that re. the BBC is via the Corporation’s online consultation.